Don't panic! I'm not dying or anything like that. I'm a thriver. I'm a survivor. I can't die... Yet. You see, I have been inspiring and motivating on this blog for nearly five years now. And, folks have been very receptive and kind. However, I sort of niche'd myself into a select group with my blog name. This is actually okay, considering that I first created this blog with one intention - I wanted to help others dealing with HIV and AIDS by showing them how I've successfully managed to live this long. I created "The Secret" for this very reason. The whole idea was to have a website where I could publish articles on my trials and tribulations. 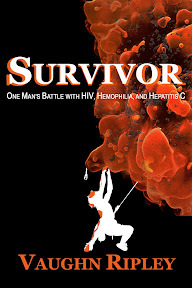 And, how I've survived despite having HIV. Here we are nearly five years later (I started this blog on Friday the 13th in February of 2009) and I have not only accomplished my goal, but created a wonderful timeline of life events and stories at the same time. I will continue to keep this blog up and available, because it is jam packed with useful information and stories. And, I will continue to monitor it for comments and be responsive. However, I'm not planning on posting any major articles. If something changes with my HIV or with HIV in general I will be sure to put it up here. Also, I am compiling all of the "secret" articles from here and building a free ebook that I will publish in PDF format. Please drop by my new blog Healthy Wealthy Tribe and chime-in on my inspirational posts there. You can also subscribe to be on my email list at my new blog and make sure you never miss one of my diatribes! Father's Day was a special treat this year. My children are getting older and finally grasping what these holidays mean. I got lots of love and some wonderful homemade cards among other things. Despite all of these creative gifts and tons of love, I believe that the greatest gift I received was an eye-opening experience about parenting. One of my favorite quotes is from James Dean. I love the quote so much that it hangs (with a photo of him) in my den. This quote holds so much power, and it's sort of ironic that it came from a man who died at the very young age of twenty-four. A man who lived his life to the fullest and died young. Our last On Writing blog article was about the choice to outline or not. Now that you've gotten past that stage, let's talk about where you can find some creativity when you aren't feeling particularly creative. I have heard people from time-to-time say things like, "Workout, eat healthy, and die anyway." Or they might ask, "Don't you think that working out is a waste of time you could better utilize?" I have thought long and hard about these kind of naysayers. I've drawn my own conclusion that I decided to share. Today I am back in motivational mode. We are going to learn what Cowboy-up means to me. No, I do not wear cowboy boots and a six-shooter during my workouts. These are merely props to demonstrate my euphemism. Besides, they look cool next to the iron. In circa 1973, Frank Zappa released a song about television. This song, I Am the Slime (Oozing Out of Your TV Set), tells a tale of how bad TV can be ... Well, I often think of this song with a futuristic slant on it. I think in the 90's you could have replaced TV with video games. Nowadays you might be able to say the same thing about the Facebook. To me, it is a necessary evil ... Yet I also think its the slime oozing out of our computers. i'm sitting in an irish pub. this is where the magic happens... i have made friends here. i have a writing group meeting here every week where i can find support and give support in the creation of the art of writing. the guinness flows freely, and the indian bartender vish makes the very best tanqueray martini i've ever had. Sometimes life does throw decreasing radius curves at us. I suppose before I dive into today's lesson, I should first explain this mythical curve to those of you who have no idea what a decreasing radius curve actually is. Most of you can simply guess based on the name alone. But I will take a moment and clarify so we are all on the same page.